One of the simplest and most cost-effective ways to improve the performance and style of your vehicle is to lower it. Lowered vehicles offer numerous benefits in terms of the handling and performance as well as giving it a more aggressive look. There are a number of different ways you can drop your ride height by a few inches, all of which require aftermarket suspension upgrades. Each of these options has its own benefits, drawbacks and costs. In this guide, we’ll take you through the argument for coilovers vs. lowering springs, looking at how each upgrade will affect your vehicle’s performance and discussing the benefits of each. 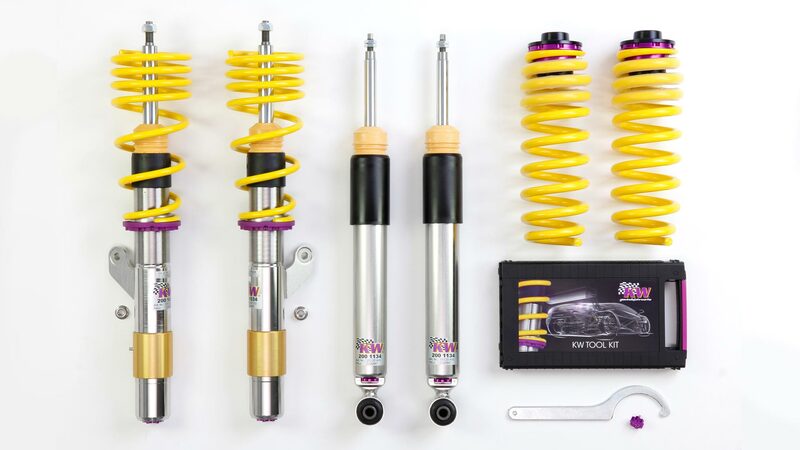 A coilover, short for ‘coil spring over strut’, is a custom shock absorber with an adjustable spring that sits directly over the shock or the strut. In a regular suspension system, the shocks and the springs act as two separate mechanisms. In a coilover, the spring is ‘coiled’ around the shock, allowing the two to work as a single element. That helps with what’s known as ‘damping’, which refers to the vehicle’s ability to absorb impact from the road. This innovative system originally came from the race track but is now a very popular aftermarket addition. Coilovers give the average driver the ability to fine-tune their suspension and reduce the ride height to improve their vehicle’s handling and give it a more aggressive stance. Adjustability – A key advantage in the coilovers vs. lower springs argument is the much greater range of adjustability coilovers typically provide. You can adjust the ride height, compression, camber, caster, and rebound. Coilovers also allow for very specific height adjustment (to the millimetre) which lowering springs cannot match. Handling – If you want the best possible handling when you take your car to the track, coilovers are probably the right choice for you. Coilovers allow you to customise your suspension to within an inch of its life, so it does more of the work while cornering and in other parts of the drive. Typically, coilover sets also feature stiffer spring rates than lowering springs to deliver additional cornering performance. Quality – Coilovers are highly regarded in the car community. Some of the best performance vehicles ride around on these specialised setups, so you should get some extra kudos from fellow modifiers. Unforgiving ride – Coilovers often involve a compromise between handling and ride quality, particularly if you fit a set at the budget end of the spectrum. As coilover sets usually feature stiffer spring rates than lowering springs, they can produce a harsh ride and leave you vulnerable to speed bumps and uneven road surfaces. Price – Coilovers are more expensive than lowering springs and unless you really know what you’re doing, you’ll also need the help of a professional to fit them. They can cost anything from a few hundred quid all the way up to the thousand-pound mark. If you drive your car on normal roads and simply want to lower the vehicle and experience some of the benefits of superior handling, a set of performance shocks with high-quality lowering springs will usually represent better value. They need a lot of space – Unfortunately, there’s only so much space under the chassis of your car, and you might find coilovers demand more of that space than you might like. That can cause problems with coilovers coming into contact with sway bars, the cables of antilock braking systems and even with your tyres. Check you have plenty of space under your wheel arches before fitting this particular part. In the coilovers vs. lowering springs debate, lowering springs are certainly the simpler of the two options. Lowering springs are shorter suspension springs than the parts originally fitted in the factory, so your vehicle sits closer to the ground. Lowering springs fit neatly into the space left by your original springs so there is little or no modification necessary, making this a part you could easily fit yourself. Fitting lowering springs to your vehicle will reduce the centre of mass, which will boost the handling and stability of your car. There’ll also be less body roll to keep your car flat while cornering. However, with any modification you make, there’s always a trade-off. Lowering springs have a higher spring rate than your original springs and that will produce a harsher ride. Compatibility with existing parts – One of the chief benefits of lowering springs is their compatibility with your existing parts, making them much cheaper and easier to fit than coilovers. Simply remove the existing springs and replace them with the new ones. They’re more like standard parts – In the scale of things, lowering springs are a pretty minor modification. That makes them less likely to void a warranty and more suitable for day-to-day driving. Price – Lowering springs are considerably cheaper to buy and fit than coilovers. If you have a relatively limited budget of around £200, you’ll get a much better product by opting for a decent set of lowering springs rather than budget coilovers. Lack of adjustability – This is one area where coilovers have a clear advantage in the coilovers vs. lowering springs debate. Lowering springs are typically sold in 0.25-inch/~6mm increments, so you won’t be able to achieve the same level of ride height precision as you would with coilovers. Handling – Lowering springs lower the centre mass of your car to reduce body roll when cornering, improve road stability and give you better handling when compared to factory parts. However, lowering springs do not provide the same level of performance benefits as coilover sets. Spring rates are not always matched to dampeners – Lowering springs often have higher spring rates than factory units, which means the dampeners have to work extra hard to keep the car under control. If the dampeners are not correctly valved for the spring rate and ride height, you could have a potentially dangerous problem. This is most likely to occur with poor quality lowering springs which push the dampers beyond their operating range. Coilovers vs. lowering springs – which is it to be? Hopefully, we’ve illustrated that there are some pretty compelling advantages associated with both coilovers and lowering springs. Choosing the most appropriate part for you really depends on how your intended application matches up to those pros and cons. If you are on a relatively limited budget, your primary goal is to lower your vehicle and you’ll be doing most of your driving on the roads, we’d advise you to opt for the lowering springs. On the other hand, if you want to improve your performance on the track and your vehicle is only used sporadically on the road, we’d suggest that a set of advanced shock adjustable coilovers would be the best option. They may cost considerably more, but the performance advantages they’ll bring you over tight turns and at high speed will ultimately be worth it. At Czok, you can buy leading suspension coilovers and lower springs from a wide range of manufacturers at some of the best prices online. If you’d like to know more about coilovers vs. lowering springs or ask for specific product suggestions for your make and model of car, just leave a question on our forum or get in touch with our team.